Sleek and contemporary, this brushed nickel finish floor lamp is paired with a double white drum lamp shade on top. A chic and versatile metal floor lamp style that will work in a variety of spaces. The energy-efficient Light Blaster™ design will create savings while not sacrificing the light output, comparable to more than 400 watts. The four-position switch provides easy operation. In a brushed nickel finish with a double drum shade on top. Overall: 67 1/2" high. Base is 12" wide. Inner shade is 23" wide, 9" high. Outer shade is 24" wide, 10" high. Includes four 26 watt GU24 CFL bulbs. Light Blaster™ energy efficient brushed nickel floor lamp. Light output comparable to 500 watts, but uses only 96 watts. Can you use incandescent bulbs in this lamp? BEST ANSWER: Hi - No, this specifically uses a GU24 base bulb (CFL or LED). 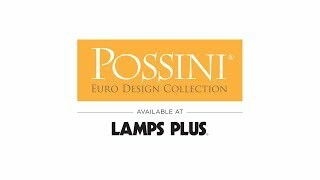 Are the shades on Possini #7J459 and Possini #1M153 the same white double shades? BEST ANSWER: Hi - They were not designed to be the same, but they look very similar and almost identical in style and color. They would compliment each other very well. Are both inner and outer shades white? Or is the outer shade more silvery? BEST ANSWER: Hi - the outer shade is a sheer silver color with an inner white colored shade. Is the lamp adjustable in height? BEST ANSWER: Hi - no, the height is not adjustable, it is at a fixed height. Do the CFL bulbs give off a warm yellow tinted light or bright white light (like led light)? BEST ANSWER: The CFL bulbs that come with this fixture have a light output of 1650 lumens which is comparable to the light output of a 100 watt incandescent bulb The bulbs have a 2700K color temperature which is similar to the warm light of an incandescent bulb. The fixture will be bright because of high lumen output but it will have a warm color temperature. Does this only take CFLs? BEST ANSWER: The bulb sockets are designed for GU24 based bulbs. You could replace them with GU24 based LED bulbs if you prefer. Click on the image below for an example for a GU 24 based LED bulb. I wanted to upgrade my living room with a modern look but wanted to have great light and this was the perfect mix. The softness of the shade adds warmth to the room instead of just being cold as silver and grey can be. the light offers 3 different levels of light so I can get some (which I use most of the time), but when I need light for the whole room its there! !.